Since 1998 the Jewish community of North Fulton gathered in trailers for Jewish education, worship, programs and simchas. 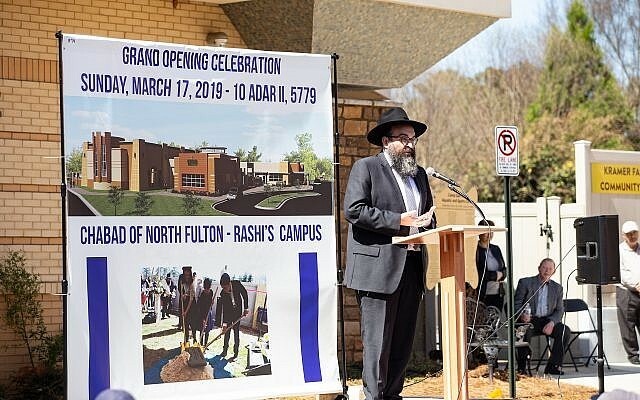 Rabbi Hirshy Minkowicz addresses the community at the opening of North Fulton Chabad Rashi’s Campus. Since 1998, when Rabbi Hirshy and Rashi Minkowicz set up camp on Jones Bridge Road, the Jewish community of North Fulton gathered in trailers for Jewish education, worship, programs and simchas. 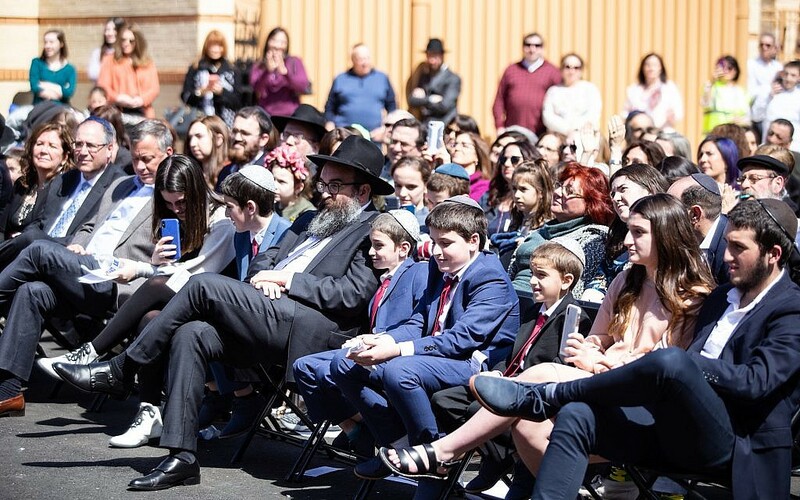 “When Rashi passed away, the community came together, led by a push from our oldest son Mendel, 14 years old at the time, and decided it was time to build a permanent home for Chabad where her legacy and work could continue for generations to come,” Rabbi Minkowicz said. On Sunday, 800 attendees toured the 23,000-square-foot campus that includes a luxurious mikvah, swimming pool and splash pad, locker rooms and a sports field. The new synagogue has a main sanctuary, weekday chapel, social hall, classrooms and two fully equipped kitchens. Minkowicz children cutting the ribbon at the entrance of the new building: Henya, Tonia, Yoeli, Mendel, Naf Tali, Shaya, Dovid and Alter. The new facilities enable more programming and classes, as well as the re-opening of the preschool. “It’s a dream come true to have a preschool in our beautiful facility. I can’t wait to welcome new students to explore, learn, play and share with them and their families what makes our community so special: joy, warmth, kindness and a sense of belonging,” said preschool director Jeannette Sinasohn. Anthony Shapiro, the master of ceremonies, introduced a lineup of icons in the national and local Jewish community, including: Rabbi Moshe Kotlarsky (Chabad World Headquarters), Rabbi Yossi New (Chabad of Georgia), Mike Bodker (mayor of Johns Creek), Luna Bukiet (former shlucha or emissary of Chabad of North Fulton), Rabbi Gedalya Hertz (partner rabbi of Chabad of North Fulton), and Rabbi Mendel Minkowicz. The crowd at the grand opening of Chabad of North Fulton. 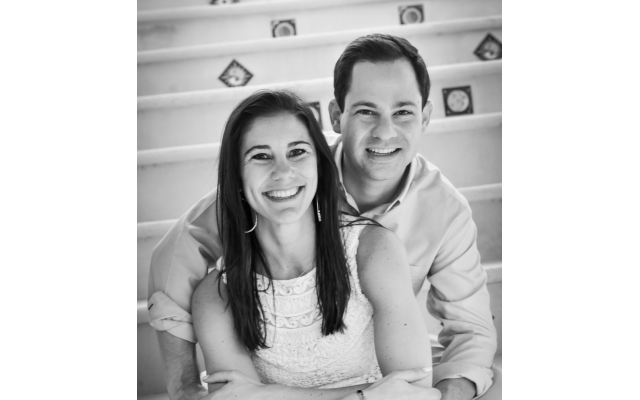 Nearly two years ago, Rabbi and Ruti Hertz moved to North Fulton to partner with Rabbi Minkowicz and the Chabad community. 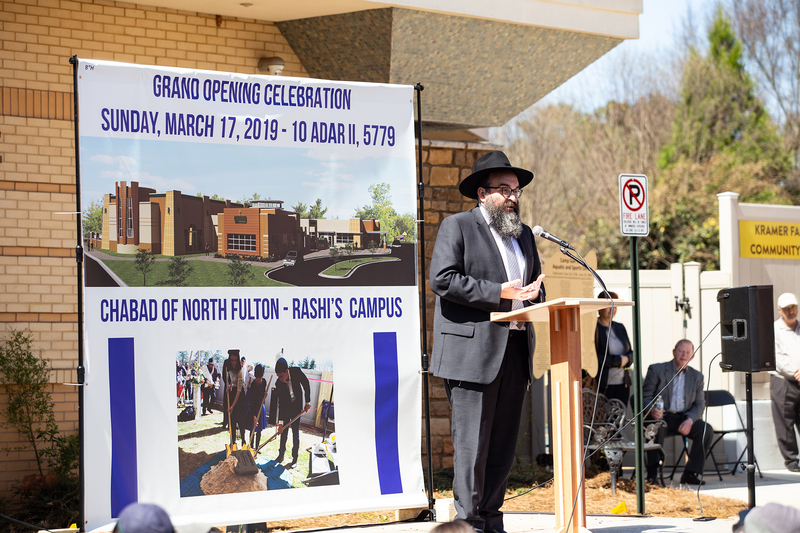 “Standing here today, which happens to be just a few days shy of our second-year anniversary of moving to Chabad of North Fulton, I would like to express thanks and appreciation for being a part of this community,” Rabbi Hertz said. 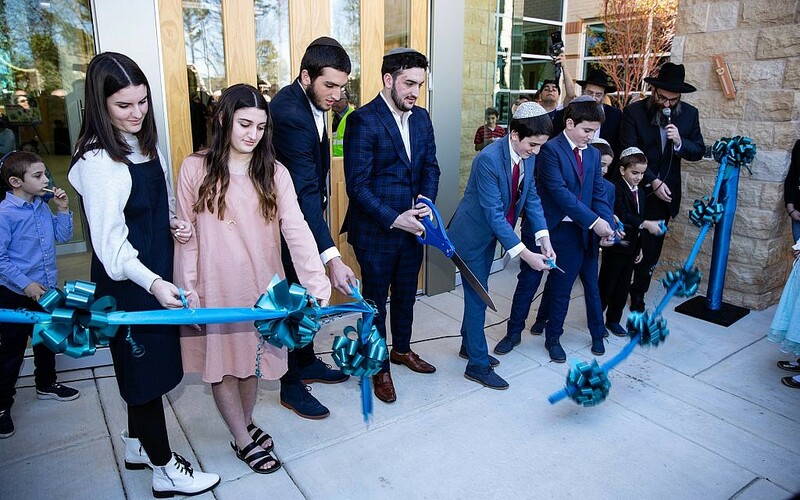 The event continued with a procession and march to the front doors of the building, a brief speech by the children of Rabbi Hirshy and Rashi, a ribbon cutting ceremony, the hanging of the main mezuzah and a lavish lunch and celebration.